– Trip cost of $1895 includes all lodging (double occupancy), most meals, local transportation, translation, entrance fees and $400 donation to Mayan Hands (with tax deduction receipt). – Discounts available for Mayan Hands supporters. Contact us for details. – Airfare and personal expenses not included. We are excited to announce the dates of our next Fair Trade Weaving Adventure, January 14-24, 2015. Escape winter and come with Mayan Hands to Guatemala, the Land of Eternal Spring! Meet the amazing women of Mayan Hands and learn about Fair Trade and the difference it makes in the lives of artisans, their families and communities. Learning to Weave and Guatemalan Woven Wealth, has led dozens of groups on journeys of discovery in her adopted homeland of Guatemala. Experience the natural beauty of Guatemala and immerse yourself in Mayan culture, ancient and contemporary, in the homes of weavers, in extraordinary markets and museums and in your connections with Guatemala’s greatest treasure, her people. You will return home with your spirit renewed and hope restored. Mayan Hands is a fair trade, nonprofit organization working in Guatemala with more than 175 Mayan women, organized in cooperatives, who seek to bring their families out of extreme poverty while they continue to live within the culture they cherish. We are proud members of the Fair Trade Federation. The Seattle Weavers’ Guild Annual Sale offers an opportunity for the greater Seattle community to experience over 3,500 original textiles and purchase unique handwoven items from local weavers, some of whom have practiced the timeless art of weaving for more than 30 years. The sale will showcase one-of-a-kind handcrafted items, including towels, rugs, blankets, tapestries, exquisite jewelry, accessories for pets, children’s items, handmade cards, household goods, hats, bags, wall art, jackets, scarves, wraps, sculptural baskets, liturgical weaving, handspun and/or hand-dyed yarns along with weaving and spinning tools. We invite you to join us at our Annual Sale to see the work of our hands and hearts as we follow the thread of this ancient craft. There will also be demonstrations of spinning, weaving and other fiber crafts during the sale. To find out more about the Seattle Weavers’ Guild, email sale@seattleweaversguild.com or visit www.swg-sale.com. 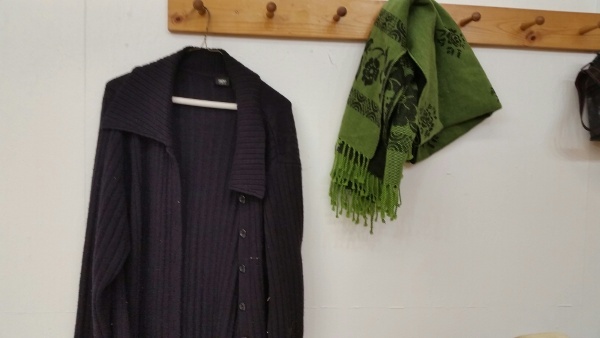 Someone left a black sweater and a green shawl at the Fair in the back room of the demo area (see picture). I will take them to the Administration building Lost and Found at the Fair for pick up. Thanks for all the guilds that demonstrated. You always attracted a crowd. I have attached a tentative schedule for 2015. Please send me a reply if the dates look good for your guild by the end of October to confirm your spot. There are additional groups interested in demonstrating next year. The fair dates are Sept. 11 to Sept. 27. The final weekend of the fair is the same as Oregon Flock and Fiber. Let me know if you have a new contact person for your guild. I do have the change for Arachne Guild. The Sheep to Shawl entries will be upstairs in Home Arts for pick up for Seattle Weavers Guild, Tacoma Weavers Guild and Olympia Weavers Guild on Tuesday and Wednesday. This week I will request payment for your participation. Checks should be out by mid October. Contact me if you haven’t received your check by the end of October. Sheep to Shawl Judging 11:30 a.m. – 1:30 p.m. The Olympia Weavers Guild was invited to demonstrate weaving and related textile skills during Nordic Heritage Day at the Sons of Norway Lodge in Lacey, WA. The demonstration included tapestry, inkle and tablet weaving looms, books and discussion of historical production and uses of textiles. There was also an ongoing demonstration of drop-spinning prepared flax fiber into linen yarn, complete with a distaff tucked into a belt. Here is a video prepared by the organizers, showing all of the different displays and demonstrations during the day. Kate Jantz-Koprivnik would like to invite guild members to the Thurston Community Television open house on September 27.
installing state-of-the-art studio production equipment. Now.. IT’S FINISHED! We have a beautiful, new High Definition control room and 4 new studio cameras (two of them are on robotic pan/tilt heads). There’s also a new audio recording booth. gathering space. The front lobby has a wall dedicated for art displays. the new audio booth, create an animation, or give a “Shout Out” in front of our green screen. We’ll have refreshments and door prizes, too! TCTV is YOUR community media center. Join us on September 27th to learn how you can put yourself in the picture! Join Jean Pierre Larochette and Yael Lurie as they celebrate the release of their new book, “The Tree of Lives: Adventures Between Warp and Weft.” The event will include a slide presentation by the artists. Sunday, September 28, 2014, 3:00 – 5:00pm. University Friends Meetinghouse, 4001 9th Ave. NE, Seattle, WA 98105. Directions. This event is free and open to the public. Please forward this email to anyone you think would be interested in attending. No need to rsvp, but if you have questions, please contact: Mary Lanemarylane53@mac.com. Parallel Patterns – Significant Schemes, Seams, & Symbols is a juried fiber arts exhibition revealing meaningful themes, designs, and relationships through fiber, fabric, and fashions with creative consideration that reflects and sometimes repeats imaginative motives, motifs, lines, and serendipity.